Student Geek is aimed and created in the UK but the content is for the world, it is important to understand the internet at the moment can be accessed across the world that values an open, secure, and free Internet. It does need protecting but that’s when education, common sense like not allowing minors, prevention of copying content using digital technology like DRM and making it easier and better to go legal should all help to improve piracy. Even though this legislation is being created in the US it affects us all and will set a president for other countries to follow. A lot has improved for example Music buying has changed it has become easier to buy music easier and cheaper without the fluff of CD cases from Zune, iTunes and even listen to it for Free with Spotify or Last.fm so it has helped a lot and change attitudes but with Movies services are slowly becoming popular in like Flixster, LoveFilm, or BlinkBox. More TV’s get connected to the Internet the easier it will become. 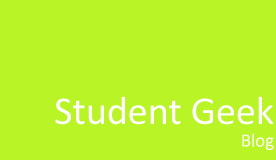 Student Geek values open, secure, and free Internet. ← New Year! = New Password!